Jaipur, 28th November: The Department of Tourism (DOT), Government of Rajasthan and Shruti Foundation in collaboration with All Ladies League will be organizing a 4-day ‘Vedaaranya Heritage Arts and Healing Festival’ (VHAH) from 6 until 9 December. 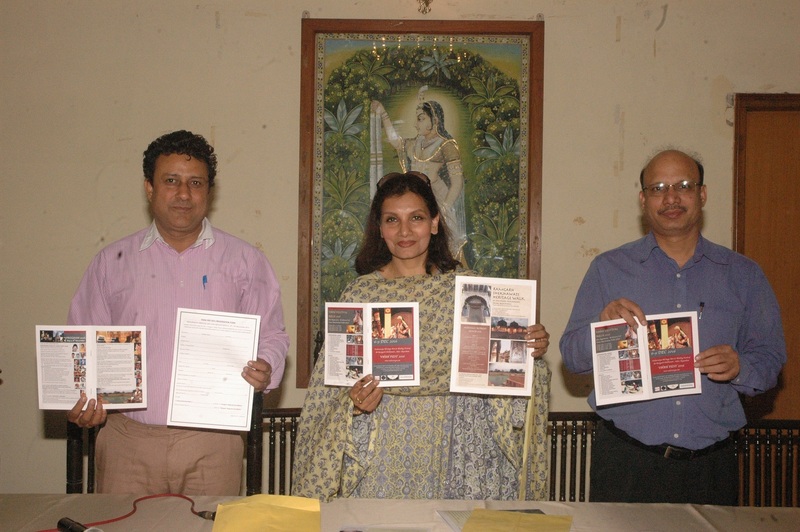 The festival is scheduled to take place at Ramgarh Shekhawati in Sikar district, near Churu. In order to create awareness about reviving the heritage spaces, some spectacular shows and a number of activities have been planned throughout the festival. This was informed today by Founder of Shruti Foundation, Ms. Shruti Poddar at a media briefing at Hotel Khasa Kothi. Ms. Poddar further informed that the launch of VHAH Fest is an opportunity for healing and resurgence of our living heritage. The underlying objective is creative, social and economic development of the local artistes of Ramgarh Shekhawati region. The Joint Director (Marketing), DOT, Mr. Anand K. Tripathi said on the occasion that the festival is being organized for the first time in the region. This is an earnest effort to promote the region and the Tourism Department is providing its support. On day 1 (6 December) there will be an inaugural function in the morning. In evening there will be a Vedic solo performance ‘Satyam Shivam Sundaram’ by renowned artiste Ms. Geeta Chandran. It will be followed by a performance by maestros Pandit Rajan-Sajan Mishra. On Day 2 (7 December), there will be interactive sessions – “The Healing Power of Mantra” by Shruti Nada Poddar, the ‘Genius of Indian Scientific Heritage’ by Maths Genius, Prof C.K. Raju; Master Classes will be taken on ‘Gems From Our Spiritual Heritage’ by Member of Parliament, Mr. Dinesh Trivedi; ‘Meditation for Concentration’ by Mr. Aditya Ahluwalia and ‘Ramgarh Ke Deewaron Ki Kahaniyan’ by Guru Shovana Narayan on stories painted as frescoes on Ramgarh Shekhawati Walls. The evening will witness a classical folk music performance by Maestro Pandit Chhanulal Mishra, followed by the Folk dancers Manganiyaars and Langas with the Kalbeliya dancers. Day 3 (8 December) will begin with Ramgarh Shekhawati Heritage walk. It will be followed by Master classes on ‘Ramgarh Ke Chhatriyon Ki Kahaniyan’ by Guru Shovana Narayan explaining stories from heritage painted on Chhatris of Ramgarh Shekhawati; ‘How to make our lives healthy & Do It Yourself for Personal Protection’ by Healthy Building Innovator and Pioneer, Mr. Ajay Poddar and ‘Tabla master class’ by eminent artiste, Shri. Tansen Shrivastava. A classical and semi-classical music performance will then be rendered by music icon, Ms. Shubha Mudgal. It will later be followed by a theatrical performance ‘Natya Katha: Krishna’ by Padma Vibhushan, Dr. Sonal Mansingh. The last day of the festival (9 December), will witness a Valedictory Session and presentation of certificates. It will be followed by the Vedic Chanting in the morning along with the Vote of thanks. Apart from the various interactive sessions, master classes and cultural performances — ‘VHAH Festival Mela’ will also be held during the festival at Ramchandraji Poddar Johad. For this, the registration is free and no entrance fee will be charged for the general public for the Vedaaranya Festival Mela. A number of stalls on heritage cuisine, heritage artefacts, blue pottery, Shekhawati furniture, traditional dresses and traditional herbal medicine etc. will be put up for the tourists and visitors. Apart from this, there will be plethora of activities like heritage restoration, Ayurvedic medicine making, Mehndi applying, Khaat weaving, traditional games and sports, pottery and textile workshop among others.